Vintage - Spode China, Earthenware Rectangular Covered Vegetable Bowl in the "Camilla-Blue" Pattern, Circa 1950, Priced Individually. 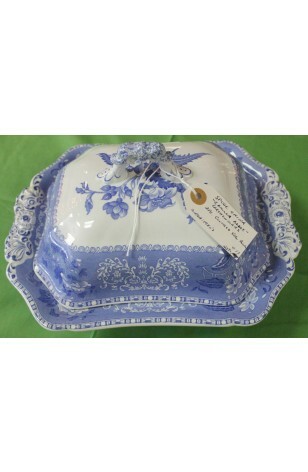 This great looking Vintage Spode China Earthenware, Covered Vegetable Bowl, as seen, comes in the "Camilla-Blue" Pattern. Rectangular/Squared in Shape, with Lid. Made in the 1950's. Has detailed Blue Flowers and Blue Band with White and Darker Blue Patterns, is Scalloped, and Dish itself, has Shaped Handles, and is on a Footed Base. This is a great Serving Dish, and would go well with any Blue and White Color Scheme. Priced individually, Select the Quantity you want. Great Condition as seen by the pictures.